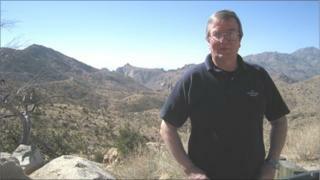 A Welsh astronomer has had an asteroid named after him by the Spacewatch programme in the United States. Jay Tate is director of the Spaceguard Centre near Kington, Powys, and has worked with the American scientists who discovered the asteroid. "Once its orbit has been calculated then the discoverer gets the opportunity to give it a name," he said. The asteroid, once known as 2000 DZ12, is now officially known as "Jaytate". It circles the Sun on an orbit between Mars and Jupiter. Mr Tate said that the asteroid is "too far and too far away" for him to be able to see it with the telescopes at the Spaceguard Centre. "What we're going to try to do is to use one of the two big Fawkes telescopes, probably the one in Hawaii, to try and get a couple of snaps over the next week or so," he said. In June 1996 Mr Tate submitted a proposal to the UK Ministry of Defence and the Department of Trade and Industry for the establishment of a British National Spaceguard Centre to study the threat posed to the UK by the impact of an asteroid or comet. He set up the independent Spaceguard centre in 1997, which is funded by sales from an onsite shop and tours of the observatory.